Just over a hundred years ago, here in the flat, windswept fields of Western Flanders, Britain embarked upon the bloodiest and most futile battle of the First World War. For three years, British forces had been bogged down in the Ypres Salient, surrounded on three sides by the Germans, who held the higher ground. On 31st July, 1917, the British launched a massive attack, an attempt to seize a hilltop village called Passchendaele, and break open the Western Front. The battle raged on until November, through a sea of mud, until British and Commonwealth forces finally entered Passchendaele, only to find they could go no further. Beyond Passchendaele lay another line of German fortifications, and then another. The Allies had taken three months to advance five miles, at a cost of 300,000 men. And then, a few months later the Germans advanced, and swept them back again. 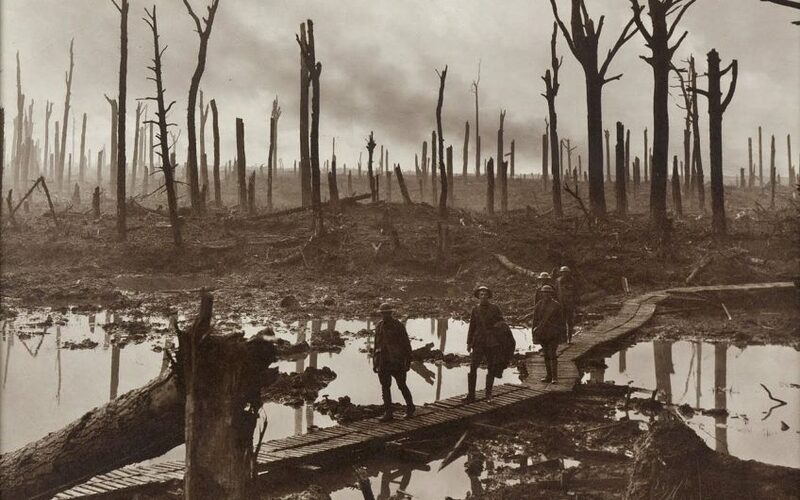 That, in short, is the story of Passchendaele (pictured), and the reason why I returned to Flanders almost a century after the Armistice – to thank my lucky stars I didn’t have to fight here, and to pay my meagre respects to those who did. Like a lot of visitors, I had relatives who fought (on both sides, in my case) but that’s really neither here nor there. Passchendaele is universal, no matter who your ancestors were. Its sheer scale is overwhelming – the bare battlefields, without an inch of cover, the endless rows of headstones, the myopia of the generals, the useless heroism of the men. But although I’d come to see these battlefields again, there was another place I wanted to revisit, a day’s march from Passchendaele, where these brave, bewildered Tommies found some fleeting sanctuary. Last time, I only spent a few hours here. This time I came for three days. I didn’t want to leave. At first glance, it doesn’t look like much – an old townhouse on a humdrum side street in a quiet Flemish town called Poperinge. Only the sign above the door gives the game away. ‘Talbot House – Every Man’s Club, 1915-?’ reads a weathered wooden board outside. Inside is a serene refuge from the modern world, an intimate relic of the First World War. Talbot House was the inspired creation of an army chaplain called Philip ‘Tubby’ Clayton, who arrived in Poperinge in 1915. The British had halted the German advance at Ypres, eight miles east of here, and, as both sides poured more and more young men into the muddy bloodbath of the Ypres Salient, sleepy Poperinge became the main railhead for the Allied forces in Flanders. Fresh troops arrived here by train and marched off to the Front, wounded soldiers were brought back here, en route to Blighty, and front line troops came here for a few days leave, a brief respite from the fighting. Just out of range of the German guns, Poperinge became a party town. Booze and brothels were a big part of it, of course, and though Tubby Clayton was no prude, he wanted to provide a place where soldiers could let their hair down without drinking and whoring. He rented a house from a prosperous Belgian family who’d fled the fighting, and transformed their vacant home into a sort of vicarage. Named after a pal, Gilbert Talbot, who’d been killed in action near Ypres, for the next three years Talbot House became a haven of sanity amid the mud and madness of the war to end all wars. Instead of hard drink and loose women, Tubby laid on more wholesome pursuits like chess and billiards and ping pong. There was a makeshift chapel in the loft, the ‘Upper Room’ where countless soldiers received Communion, but Christian worship was not compulsory, or even actively encouraged. You could borrow a book from the library, or wander round the garden, or sing a song around the piano, or simply sit around and doze and chat, and try to forget about the war (Talbot House was only hit once by German shellfire – the Belgian owners sent Tubby the bill for the repairs). When the war ended, in 1918, Tubby returned to England, where he became vicar of All Hallows by The Tower in London, remaining there until he retired in 1962 (he died in 1972, aged 87). Talbot House was returned to its Belgian owners, and became a private house again. However, in 1930, the building was bought by a charitable trust, led by the British philanthropist Lord Wakefield, and opened to the public (during the Second World War it was requisitioned by the Wehrmacht, but thankfully the building remained intact). Today, there’s a museum here, and a library, and half a dozen bedrooms. Anyone can visit – or even stay the night. A room costs just €44 a night, with breakfast, and I can heartily recommend it. The house is run by volunteers (mainly British and Commonwealth, some of them retired clergymen) who take turns to come here for a week or two, year after year. They make you feel most welcome, like an old friend in a family home. By 1945, not much remained of the original interior of Talbot House, but since then visitors and well-wishers have bequeathed all sorts of mementoes. Outside my bedroom was a photo of a fresh-faced young man called Lieutenant Horace Manton ‘Baby’ Brown. ‘Confirmed here in the Upper Room on his 21st birthday,’ read the inscription. ‘Died of wounds, 14th April 1918.’ In the garden is a bench that marks the visit of three veterans, aged 108, 106 and 105, in 2004. One of them was Harry Patch, the last surviving soldier of the Great War. Talbot House is a good base for exploring the Western Front, and one of the most harrowing sites is right here in Poperinge, in the basement of the ornate town hall. There are several cells in here, where shell-shocked deserters were imprisoned before being shot at dawn, in the courtyard right outside. One of them, Herbert Morris, was only seventeen. ‘There is no calm in my head,’ he said. ‘I cannot stand the sound of the guns.’ You can still make out some of the graffiti on the walls. A happier memento is La Poupee - a favourite bar for British soldiers throughout the war, and still going strong today. Outside is a statue of Elaine Cossey, a vivacious young waitress beloved by British troops and nicknamed Ginger, on account of her red hair (she moved to Britain after the Armistice, and died in London during the Blitz). A short drive away is Ypres, utterly destroyed during the war and entirely rebuilt thereafter. It’s an incredible feat of restoration, virtually indistinguishable from the medieval city that stood here before. The reconstructed Lakenhalle houses a sobering display about the conflict, but the most arresting act of remembrance is the Last Post at the Menin Gate, that enormous arch inscribed with the names of all those soldiers whose bodies were never found. Apart from a four year hiatus during the Nazi occupation, this simple ceremony has been enacted every evening at eight o’clock since 1928. For me, the next few days were a blur of graveyards and battlegrounds. I saw the German cemetery at Langemark and the Commonwealth Cemetery at Tyne Cot (‘Silent Cities’ as Kipling called them) and was moved to find a few British graves at Langemark, and a few German graves at Tyne Cot. I visited the Hooge Crater, where the British blew up a gigantic mine beneath the German trenches. Today it’s a tranquil lake. I visited Ploegsteert (aka Plug Street) where British and Germans troops played that Christmas Day football match in No Man’s Land in 1914. I visited the Passchendaele Memorial Museum, on the centenary of that murderous, pointless battle. I saw two live shells by the roadside, dug up by farmers just the other day.